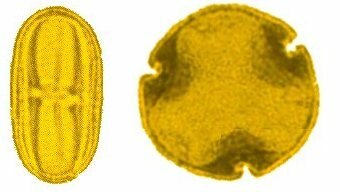 The ultimate pollen is the tricolporate grain. These forms have not only three colpi, but a central pore in each colpus. Here the pore provides a germination point for the emerging pollen tube during pollenation. In addition to the taxonomic value of the pore features, there are numerous variations in the structure of the surface of the grain itself that are useful for taxonomic purposes. Shown above on the left is a grain of pollen from Apia in the carrot family. The grain on the right is from Tilia or basswood. Tricolporate grains are present in the fossil record from Upper Cretaceous to recent.